I've had this nail polish tucked away for a while. I didn't order it for myself, but I ended up with it and I thought I might as well try it out. I did a quick swatch of it when I got it and wasn't really into the shimmer of it, but lately I have come around and started to embrace my glittery side, so I gave it another go. This shade is interesting in it's ability to shift and take on different hues in different light. The colour in the bottle has more red undertones than it does on the nail. And the shimmers, they look really great! I found kept catching myself just looking at my nails, the colour and shimmer just looked so good. 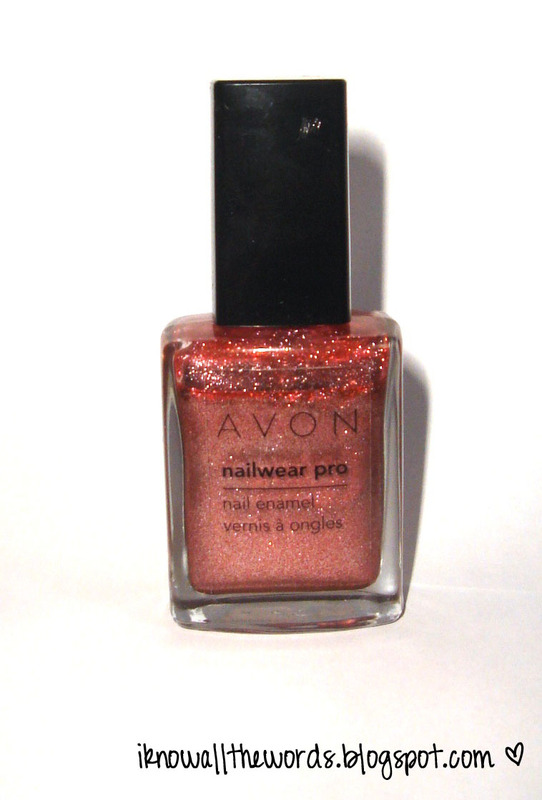 On the nail the colour varies from being a coppery pink to a mid tone pink even to a light pink. I was very happy as to how it applied as well. It wasn't a streaky mess (which I was sort of expecting) and it didn't take hours to dry. That is my main reason for avoiding Avon nail polish, I find that they take far too long to dry. I topped mine with Essie To Dry For and have been wearing it since Sunday and have only had one little chip, so wear has been excellent. If a nail polish doesn't chip after 2 days I am a very happy gal, I always seem to end up with chips faster than fast, even with base and top coat. 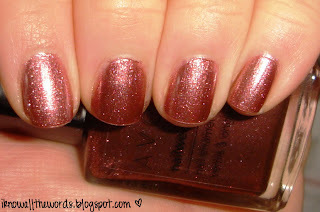 All in all I like this shade and formulation and will most likely be sporting this shimmery shade over the Holidays. Do you have this shade? Which other Avon shades would you suggest? I've never tried any Avon Polishes. I love sparkles thought!! I saw the new Burlesque colors from OPI today when I was out shopping and I was almost tempted to buy it... almost, I restrained myself from the gorgeous purple sparkly polish! This is a big step for me! I love your nails! And I love when I get that perfect polish that I can't stop staring at! I so want a few of the Burlesque OPI's! Thanks for the nail comment too. I used to wear them longer, but I prefer them short, easier to keep up with.